There are 12 devices around the house that use WiFi, and I frequently find myself downloading and uploading huge files for MikeYaroSoft projects, so it made sense to upgrade to Optimum Online Ultra. Before Ultra, regular Optimum Online served about 15Mbps downstream to the house. This new service is rated at up to 101 Mbps downstream. That’s fast. I always find the Mbps (read “megabits per second”) rating misleading, though, since nobody talks about files in terms of bits. A more understandable rating would be MBps (read “megabytes per second”). Since a byte is 8 bits, it’s just simple division. Whereas regular Optimum Online serves 1.875 megabytes per second, Ultra serves 12.625 megabytes per second. Downloading Casino Royale in HD from iTunes, a 4.54 GB file, goes from 41.32 minutes to 6.13 minutes (assuming theoretical maximum speeds). That’s the difference between my daily commute to Manhattan and the time it takes to get up and pop popcorn. The problem is, however, when we are talking about speeds like this, hardware constraints come into play. Just like you need good tires to get the most performance out of a sports car, you need the right technology and settings to maximize speed here. Jason Perlow found this out when one of his Firewall/VPN routers’ max throughput was only 60 Mbps. I was having similar trouble, but I did some testing to compare wired vs. wireless and 2.4 GHz wireless vs. 5 GHz wireless, and here’s what I found. The tests were completed using a Macbook Air (2011 model), a 2012 model Airport Extreme, Belkin Cat6 network cables, and the Arris TM822 modem at about 12:00 p.m. Eastern Time. All speeds shown indicate an average of two speed tests performed on www.speedtest.net. The first speed test was to Fortress ITX in Clifton, NJ. The second was to Optimum Online in New York, NY. 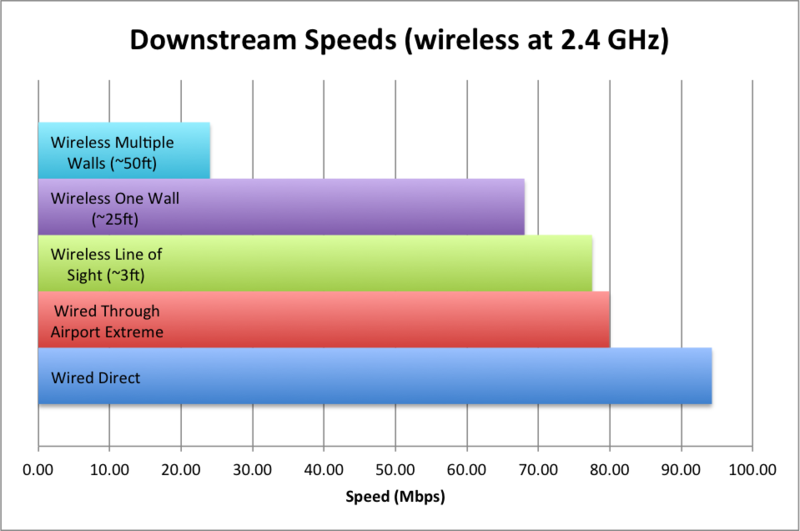 2.4 GHz is always slower than a wired connection, but it offers better long-range performance than 5 GHz. 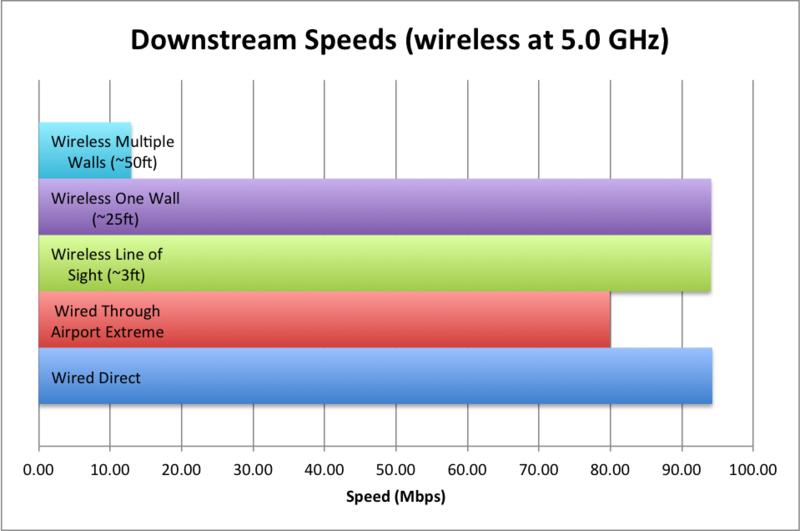 5 GHz offers speeds matching a direct wired connection to the modem up to about 25 feet, but beyond this the performance degrades significantly. 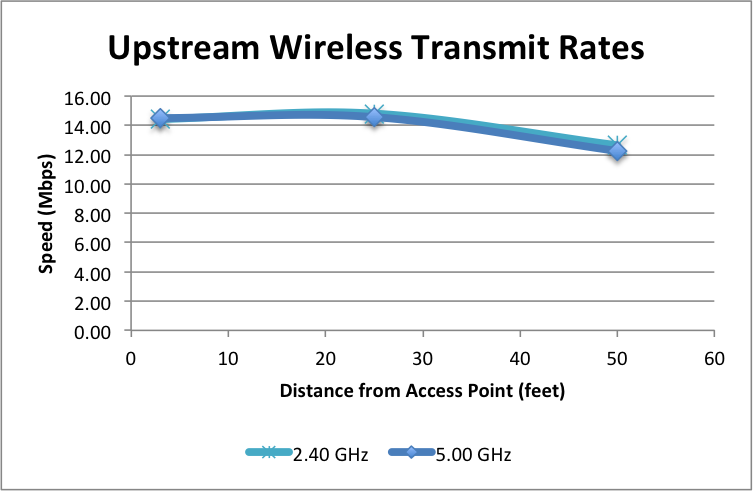 Here’s the result of comparing the wireless technologies directly. 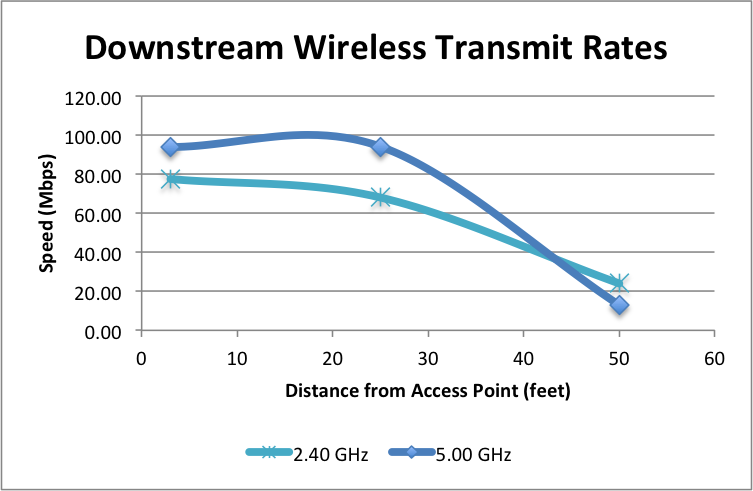 5 GHz is faster than 2.4 GHz at shorter ranges, but 2.4 GHz degrades less quickly. Both frequencies offer similar performance at multiple distances. It seems that, where a wired connection is unavailable or impractical, 5GHz at small-to-medium distances is the best bet. However, at long distances, 2.4GHz is a better option.